The Adams Ant Lab hosted elementary school children from the Junior Explorer Club of Upper Arlington. 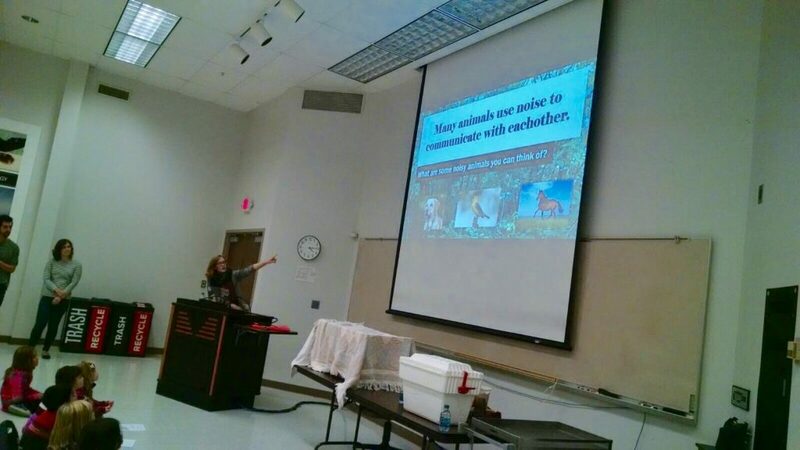 Recent graduate Mazie Davis and undergraduate students Andrew Mularo and Morgan Oberweiser put together a program to teach the little ones about various ways that animals communicate. First the students played a bioacoustics guessing game – they listened to some diverse audio recordings, courtesy of the Borror Lab of Bioacoustics, and tried to guess what animals they came from. Can you tell which animals make these sounds? Look for the correct answers at the bottom of this post. Next the students learned about the use of coloration for communication. 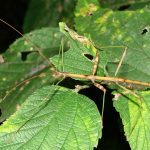 They observed camouflage in northern walking stick insects and African ghost mantises, as well as warning coloration in Peruvian black velvet stick insects and yellow banded poison dart frogs. The last animal communication system we discussed was chemical communication. The students played a game in which they were each given a scented cotton ball (peppermint, almond, vanilla) and were tasked with sorting themselves into groups using only their noses. 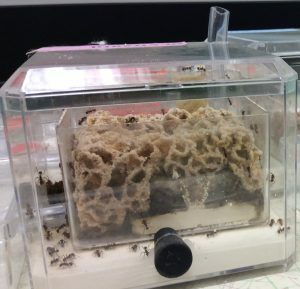 Then they compared their skills to those of our large Atta ant colony. The grand finale of the trip was a quick tour of the tetrapod collection lead by Dr. Katherine O’Brien. It was a joy to have such wonderful and inquisitive kids come to visit – we expect to see many of their excited faces return come next spring’s Open House (April 7, 2018)! About the Author: Morgan Oberweiser is an undergraduate (Evolution and Ecology major) research assistant in Rachelle Adams‘ lab. Listen to the cacophony of bird sounds at dawn. Does it make you want to be able to tell which species chime in? Wouldn’t it be nice to have an app “listen” with you and list all the bird species that are vocalizing? You are not alone, this is what researchers have been and are still working on. 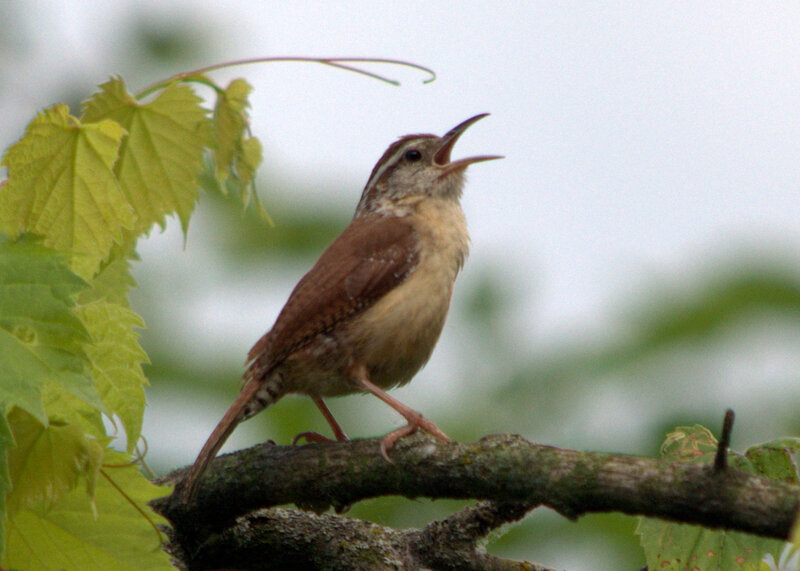 If you are somewhat familiar with bird song, you can imagine that it is not an easy task. 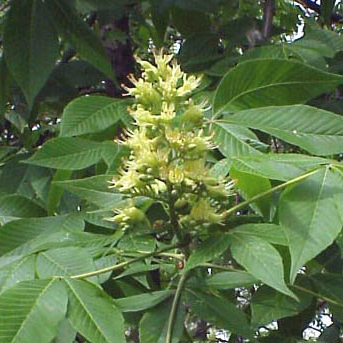 Every species has its own characteristic sounds. But even within a species every individual most likely sings more than one rendition of the species-specific song and does so with variations. 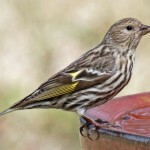 Listen to the songs of the Yellow Warbler, Chestnut-sided Warbler and Yellow-throated Warbler, three species in the wood warbler family, that commonly sing in Ohio in spring. 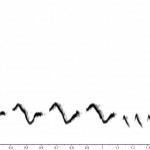 To develop a bird song recognition app, software needs to be trained with real bird songs. An animal sound archive that houses thousands of recordings is an ideal resource for this endeavor. The Borror lab has provided many of our 47,000+ recordings to different researchers. Recently, Dr. Peter Jančovic, Senior Lecturer in the Department of Electronic, Electrical and Systems Engineering at the University of Birmingham, UK collaborated with us. He and his colleagues developed and tested an algorithm on over 33 hours of field recordings, containing 30 bird species (To put this in perspective, to-date 10,000 species of birds have been described and half of them are songbirds – so 30 species is really only the tip of the iceberg). But, his results are promising, the developed system recognizes bird species with an accuracy of 97.8% using 3 seconds of the detected signal. He presented these first results at the International Conference on Acoustics, Speech and Signal Processing in Shanghai. 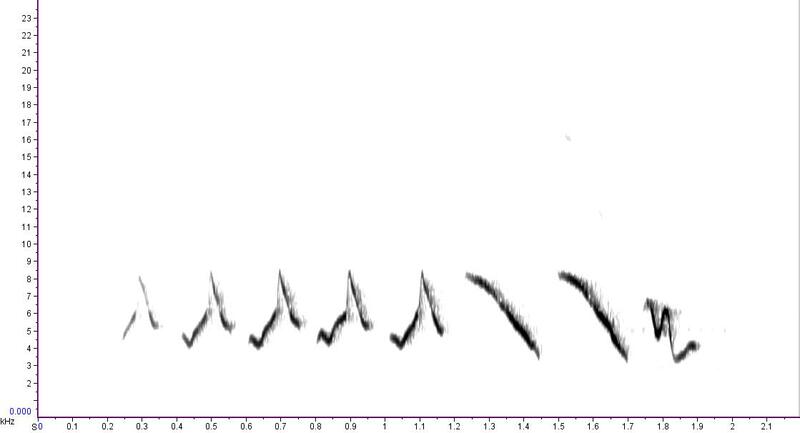 The software correctly identified this sonogram as song from a Yellow Warbler. Some prototypes of birdsong recognition software and apps are already on the market. 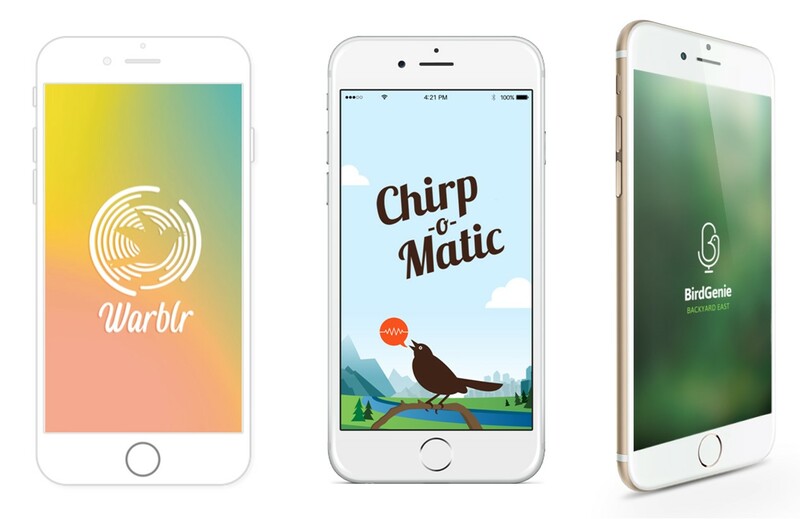 These are some of the already available bird song recognition apps that you may want to try. Think of them as the Shazam of birdsong (For those of you not familiar with Shazam, it is an app that identifies music for you). Instead of sampling audio being played you record the bird’s song in question. The software will then compare features of the recorded sound against a database based on pre-recorded, identified sounds, a sound library. 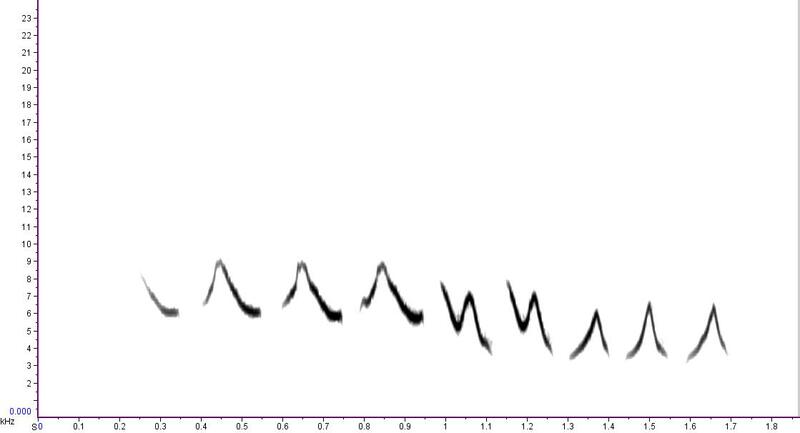 This simple sounding process has challenges and problems: You need to get a really good recording of the bird you want to identify, i.e. no other birds singing nearby, no traffic noise, people talking or lawn mowers obscuring your target sound. Once you have managed this, a good app takes into account where in the world, even within the USA and within Ohio you recorded the song. Birds sing with local variations. 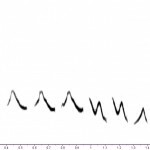 Research in our lab has focused on this for many years: Birds learn their songs by imitating conspecific adults where they grow up and will incorporate any variations these birds sing in their repertoire. 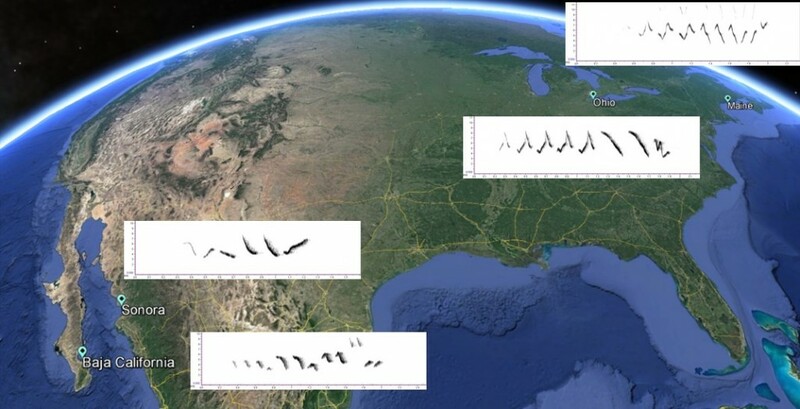 Thus the recorded sounds need to be compared to geographically correct songs of each species. Once the location has been set, the app needs to compare the recording to thousands of songs, because most of our songbirds sing at least 5 types of typical song, some sing over 100. Some like the Northern Mockingbird imitate the sounds of other species. Listen to and compare Yellow Warbler songs from Ohio, Maine and Mexico, Baja California and Sonora. I hope I have not completely discouraged you from trying one of the bird song recognition apps. They truly are an innovative application of the thousands of songs that have been recorded, archived and can be listened to for free. Have you already tried one of these apps? We would love to hear your experiences! 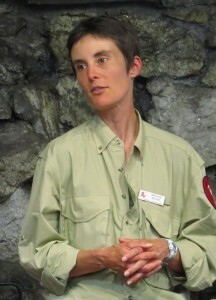 About the Author: Angelika Nelson is the curator of the Borror Laboratory of Bioacoustics. 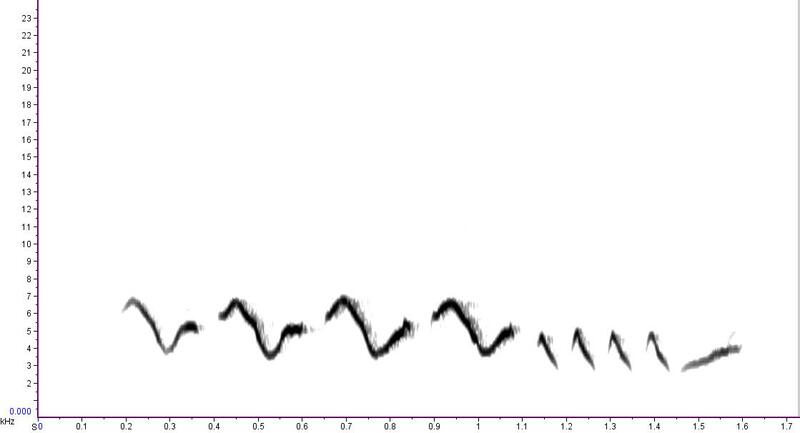 A comparison of Chirpomatic and Warblr for birds recorded in the UK. Have you heard of the Atlantic Puffin, a species of seabird in the auk family? It is the only puffin native to the Atlantic Ocean. 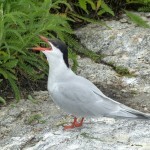 I have been lucky to see this bird on both, the eastern and western coast of its breeding range. In 1996 when I studied at Bangor University in Wales, UK I first encountered Atlantic Puffins off-shore from Puffin Island, an uninhabited island off the eastern tip of Anglesey, Wales. 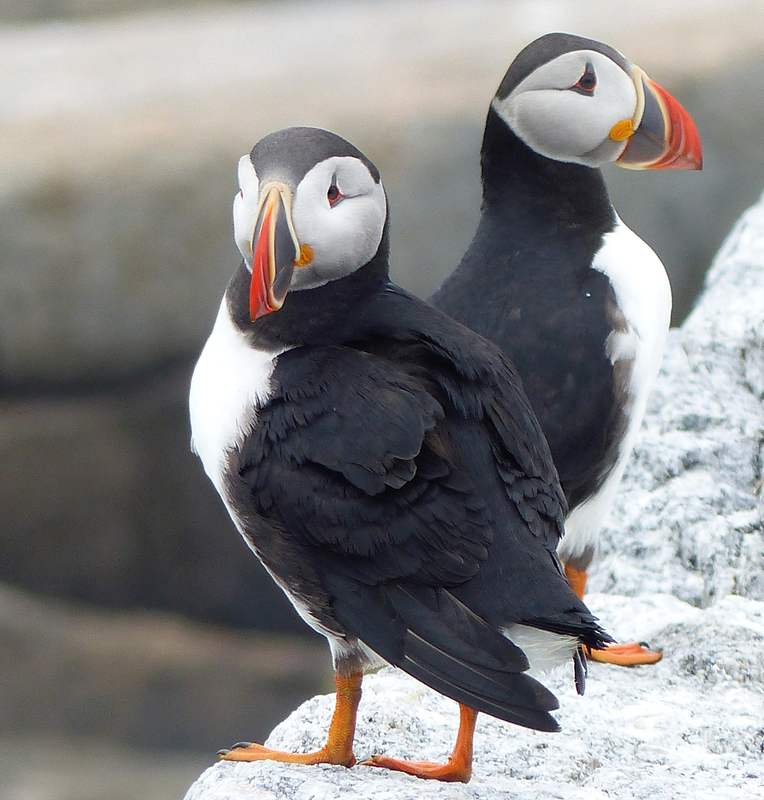 The island, as you may have guessed, was named after a breeding colony of Atlantic Puffins. Unfortunately puffins no longer breed on this island after the introduction of a fierce predator of eggs and chicks, the brown rat. On the other side of the Atlantic Oceans puffins faced similar problems, they were extirpated from many areas by a combination of egg collection, hunting for meat and feathers, and displacement by expanding Herring and Great Black-backed Gull populations. Now, thanks to Dr. Stephen Kress, I have seen Atlantic Puffins off the coast of Maine, on a small island named Eastern Egg Rock. 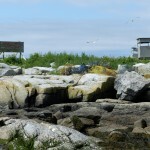 Eastern Egg Rock is a small, treeless island in the outer Muscongus Bay area. 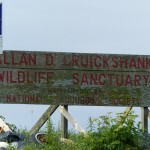 It is designated the Allan D. Cruickshank Wildlife Sanctuary in honor of Allan Cruickshank, a Maine ornithologist and photographer. 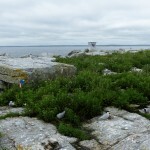 In 2015, when I taught at one of the Hog Island Audubon camps, I was lucky to land on Eastern Egg Rock as the instructor of a group of teenagers enrolled in the Coastal Maine Bird Studies for Teens. 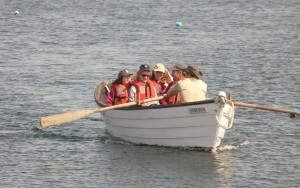 We landed on the island in one of the traditional fishing boats, a dory. 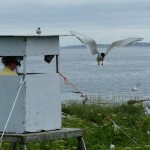 Access to Eastern Egg Rock is strictly limited, a small group of researchers spends the summer in the single hut on the island monitoring the numerous birds that breed on the island. 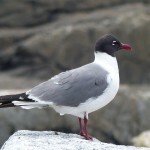 Common Terns and Laughing Gulls are probably the most common species on the island that establish nests. Less common breeders are Arctic and Roseate Tern, Black Guillemots, Common Eiders and also Atlantic Puffins. 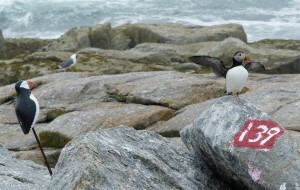 The Atlantic Puffins are a success story for conservation, the world’s first restored seabird colony. When Dr. Stephen Kress started the project in 1973 the last puffin breeding on the island had been seen in 1885. He was determined to bring a population back to this area and with the translocation of nearly 1,000 young puffins from Newfoundland, and social attraction through decoys and mirror boxes he succeeded! The first pairs of puffins began nesting on the island in 1981, now more than 100 pairs nest regularly on Eastern Egg Rock and can be seen in the waters of near-by islands. When we visited the island for the day, we each had the opportunity to spend some time in a small hut (bird hide) of which numerous are distributed across the island. There you sit in solitude, well hidden from the breeding birds that surround you and get to absorb views and sounds. It is a truly unforgettable experience to become part of this fragile ecosystem for a few hours! 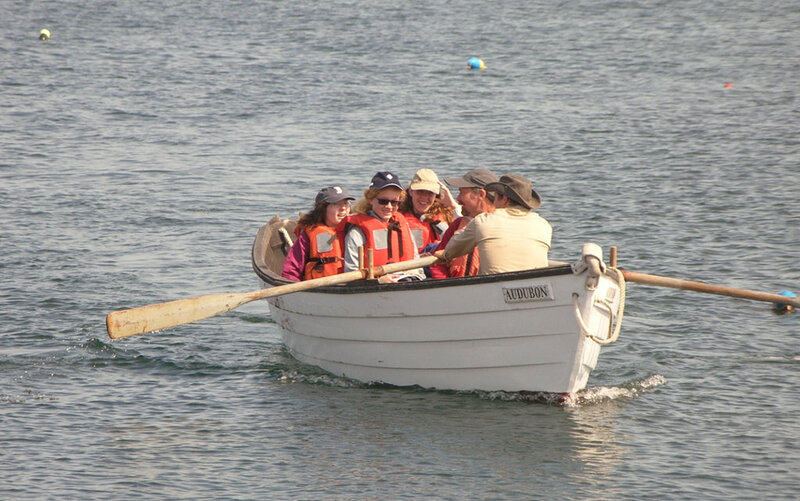 You can visit Eastern Egg Rock on a puffin cruise which leaves from New Harbor, ME daily during the summer months and circles the island to provide amazing views of the Atlantic Puffins and other seabirds. About the Author: Angelika Nelson is the Curator of the Borror Laboratory of Bioacoustics and instructor of Hog Island Audubon camps. With temperatures dropping below freezing again and the potential of heavy snowfall in the next days, spring is not the first thing that comes to mind. At least not to us humans. Songbirds on the other hand are already preparing for the next breeding season and spring may well be on their minds. You may have heard the song of a Carolina Chickadee or Carolina Wren outside your window, often early in the morning when the temperatures are particularly frigid. For these resident birds it is important to defend a territory and after a long, cold night let everyone know that they are still alive and yes, the territory is still taken! Did you know that almost 80% of our songbird species that commonly breed (and thus vocalize) in Ohio, maybe even in your backyard, do not spend the winter with us? You may not notice the dramatic decline in bird diversity, because some birds are replaced by winter visitors from the north. 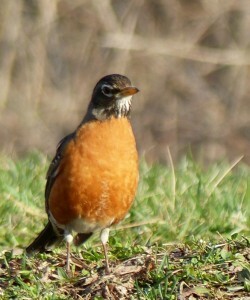 Sometimes even within a species, such as the American Robin. Many of our summer American Robins move south while birds from more northern populations come to our area for the winter. So next time you see a robin in your garden, remember that it may not be the familiar bird whose song you enjoyed all summer. If you have a bird feeder in your backyard, you may be familiar with some of our regular winter visitors. 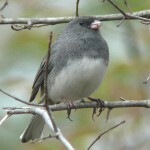 Maybe you have noticed Dark-eyed Juncos and American Tree Sparrows among the more familiar residents such as Northern Cardinal and Carolina Chickadee. 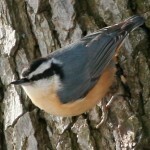 Have you seen any of the more irregular visitors yet such as Red-breasted Nuthatch or Pine Siskin? According to the Winter Finch Forecast – a report researched and written by Ron Pittaway of the Ontario Field Ornithologists each year since 1999 and published on the World Wide Web – we should be very lucky to see either of the aforementioned irregular visitors in large numbers at a feeder in Ohio this winter because of a heavy cone crop on Balsam Fir in many areas that should provide ample food for these birds in the areas north. A few months ago even the hardy birds, who spend the winter in Ohio, were quiet. Walking through a woodland in December, you would have noticed how quiet nature can be, hardly any animals made a sound then. Still now the bird chorus is quite limited, you can easily count the species that join in. This is a good time to practice your birding by ear skills. 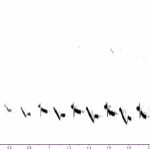 Find your favorite birds on the website of the Borror Laboratory of Bioacoustics where you can listen online to hours of sounds. Or consider listening to nature’s music on one of our lab’s CDs with animal sounds – please contact the curator for details for any of the following CDs: Voices of Ohio Birds, Calls of Ohio Frogs and Toads, Sounds of Insects and Amphibiance, and for these produced in collaboration with ODNR – Common birds of Ohio, Warblers of Ohio, Waterbirds of Ohio and Owls of Ohio. Our latest production is of birds commonly heard on and around Hog Island, Maine, a stark contrast to the other CDs that focus on animals in Ohio. Why Maine? 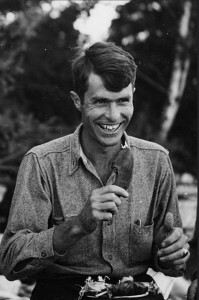 Don Borror, entomology professor and founder of the Borror lab, used to teach some of the Audubon summer programs on Hog Island, Maine through his retirement in 1977. For the past two springs I have been privileged to follow his footsteps and also teach on the island in the Muscongus Bay. 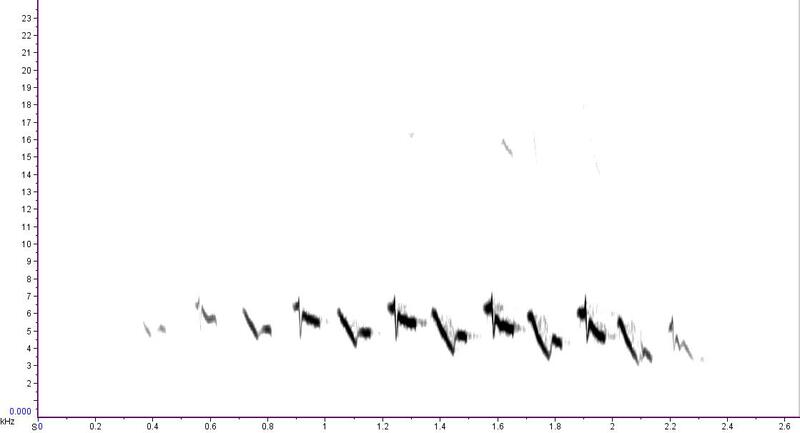 I have taught participants about the skill of ‘Birding by Ear’ as well as ‘How to make Audio Recordings of Bird Sounds’ (stay tuned for more about these topics in one of our future posts!). To aid my instruction I put together a CD of sound recordings of species that we are likely to encounter on the island and along the coast of Maine. Each track starts with the common song of the species, followed by the identification and some more, often less commonly heard sounds. 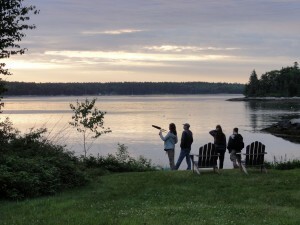 Participants have enjoyed listening to the sounds, many of them were recorded in the field by Don Borror. 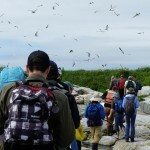 I will be teaching again on Hog Island this year during the sessions Field Ornithology (12-17 June) and Hands-on Bird Science (19-24 June) – Registration is now open with an early bird discount until February 15th. Come join me on Hog Island! About the Author: Angelika Nelson is curator of the Borror Laboratory of Bioacoustics at The Ohio State University. Photos taken by the author unless stated otherwise. As described in the 25 September post, differences in the courtship sounds that males use to attract females are often the best evidence that two groups of animals are different species. Pairs of physically very similar animals that are regarded as distinct species are called “sibling species.” Upon closer study, scientists can usually find structural differences between members of a sibling species pair, and there are often subtle differences in habitat preferences or geographic range. Two pairs of sibling species are shown below. 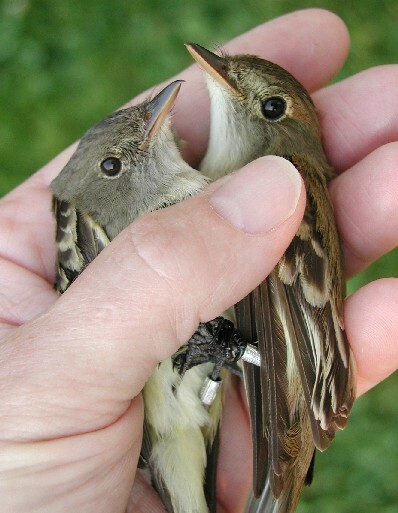 Willow flycatcher (left) and Alder flycatcher (right). The first pair is the alder and willow flycatcher, two song birds commonly found in the eastern US. Even in the hand they are difficult to distinguish, but their songs are distinct! Click on each name to listen to the song of each species on the Borror Lab’s website. Click on the play button in the gray bar to listen to the sound and to see a scrolling “voice print” or sound spectrogram of the song. The second pair contains the gray tree frog and Cope’s gray tree frog. 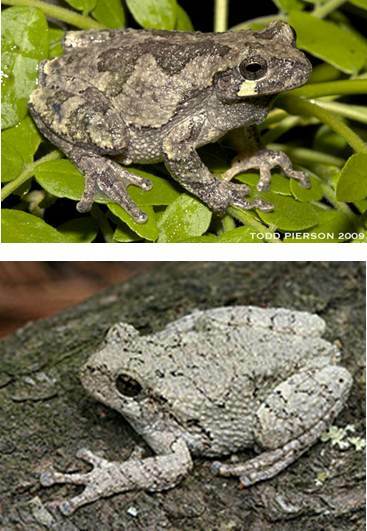 In addition to the difference in their calls, these species differ in the number of chromosomes (the gray tree frog is a tetraploid, or has twice the usual diploid number of chromosomes). These are just a few examples of the sounds in the Borror Lab’s collection. Feel free to browse the archive! About the Author: Dr. Doug Nelson is Director of the Borror Laboratory of Bioacoustics. It is common for natural history museums to house collections of plants, insects and other groups of animals. 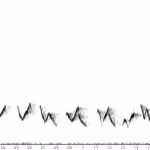 The Borror Laboratory of Bioacoustics (BLB hereafter) is a collection of animal sound recordings, one of only about 10 collections of animal sound recordings in the world. We preserve the behavior of an animal making sounds, rather than the animal itself. Why would a biodiversity museum contain a collection of animal sound recordings? 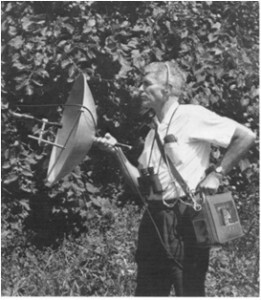 The BLB is named after Dr. Donald Borror (1907-1988), a professor of entomology and zoology at Ohio State who early on realized the biological significance of recording the sounds of insects and birds. About 15,000 of the 45,000 recordings in the BLB were made by Borror himself. Donald Borror was a systematic entomologist, a scientist who studies the evolutionary relationships of insects, and was trained in the museum methods involved in maintaining a “traditional” collection of physical specimens (see previous posts on this blog). Upon leaving the Navy after WWII, he was among the first biologists to use a tape recorder and a sound spectrograph (a machine for making “voice prints”). These tools enabled Borror and his students to record and describe the sounds of insects and birds. To return to our original question: what is it about animal sounds that is important and merits their collection and archival storage? One of the primary tasks that museum scientists face is describing species. All of our estimates of earth’s biodiversity and much work in all of biology hinges upon being able to demarcate species differences. Traditionally, scientists relied on using anatomical characters that they could see to describe different species. In the 1960’s a common definition was adopted that defines a species as a group of individuals that can breed with one another. This definition recognized behavior as being important in drawing species boundaries. Why? Animals generally don’t mate at random; although there are exceptions, females typically are choosy and males advertise to attract females. Females prefer to mate with males of their own species (because hybrids are usually at a disadvantage), and frequently rely on sound signals to make their choice. This selective pairing leads, over time, to the accumulation of genetic differences between species. Male birds, frogs and toads, some mammals and many insects use sound signals to attract females. In the 1950’s and 1960’s as sound recording in nature became practical, scientists documented many cases where what was thought to be one species was actually composed of two or more groups that produced different sounds and did not interbreed; that is, the groups met the definition of being different species. For example, after the first decade of sound recording and study, the number of recognized species of crickets in eastern North American more than doubled, as scientists, among them Borror and his students, described song differences. Many similar examples have accumulated in birds also, especially in the 5,000 or so species of song birds. Of course, every bird watcher knows that a good way to recognize many species is by their song. But the scientific basis for this common knowledge derives from the recordings deposited in sound archives such as the BLB. In addition to being crucial in identifying species, animal sounds are also used to arrange species into higher categories (genera, families, etc.) and also play a role in the study of animal behavior. 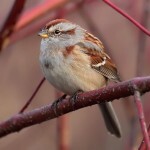 Many if not most songs of song birds vary geographically and over time. Collections like the BLB contain a rich array of recordings going back to 1948 allowing us to study how sounds vary between species and over time. 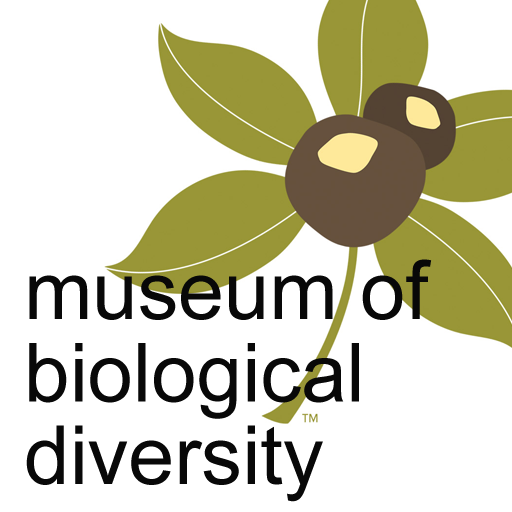 Today I have the pleasure to welcome you to OSU Bio Museum, a blog about biodiversity, research and museum work at the Ohio State Museum of Biological Diversity. This endeavor is the successor to our newsletter. That effort lived in both the physical and digital worlds, but to keep up with the times and changing needs, the blog is a wholly digital enterprise. The purpose remains the same, though: to share with the community the happenings, news, and successes (and sometimes failures) of the Museum. Our plan is to have weekly postings during the academic semester, with the post authors rotating among the different units in the Museum. We will also feature a Media Gallery every week. My objective in this inaugural post is to briefly describe what those units are and how the Museum is organized and functions. 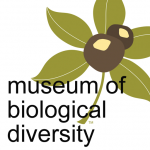 The Museum, let’s call it the MBD for short, coalesced in its present form in 1992 when the University moved the bulk of the biological collections from the Columbus campus to a newly renovated building on West Campus, at our current address of 1315 Kinnear Road. For more than 20 years the MBD has been a bit of a strange beast in that it has been a voluntary association among the collections rather than a real, defined administrative unit. Originally, most of the collections were administered by the Departments of Botany, Zoology, and Entomology. Two or three reorganizations later the primary department is Evolution, Ecology & Organismal Biology (EEOB for short) in the College of Arts & Sciences, and a smaller component associated with the Department of Entomology in the College of Food, Agriculture & Environmental Sciences (CFAES). The Entomology connection is a new one as of September 1, 2015, a reflection of a change in my formal appointment to 75% EEOB and 25% Entomology. The overall mission of the MBD, just as the University as a whole, is teaching, research, and service. Inside the building we have, of course, the collections themselves, but also office and lab space for faculty, graduate students, postdoctoral researchers, emeriti and undergraduate students. The most glaring absence, though, is space dedicated to public exhibits. 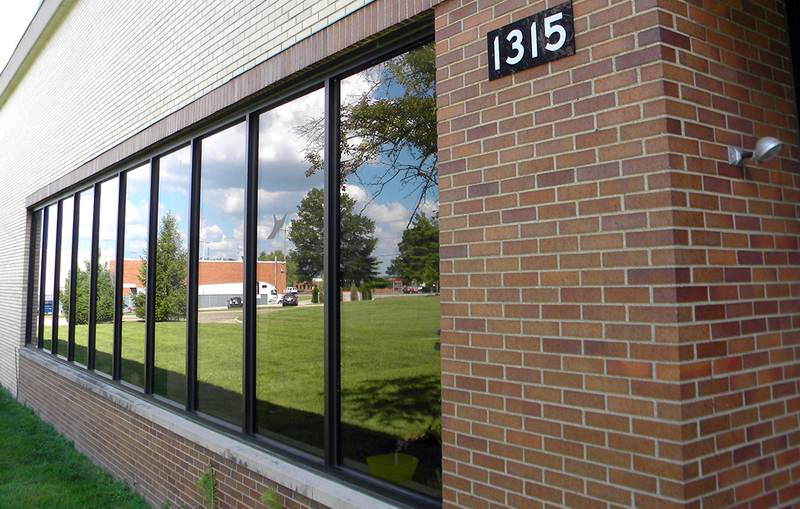 We compensate for that in two ways, our annual Museum Open House and guided tours of the facility. The tours are organized on an appointment basis only and have encompassed a wide range of groups, from elementary school kids and scout groups to University President’s Club members. Anyone interested in scheduling a guided tour of the Museum should contact us, or contact one of the collections directly to make arrangements. It’s my personal aspiration that in the future it may be possible to develop exhibit space for the public in the building, but that’s still just a gleam in my eye! If you have not done so yet, please visit the Museum website and follow our Facebook page. 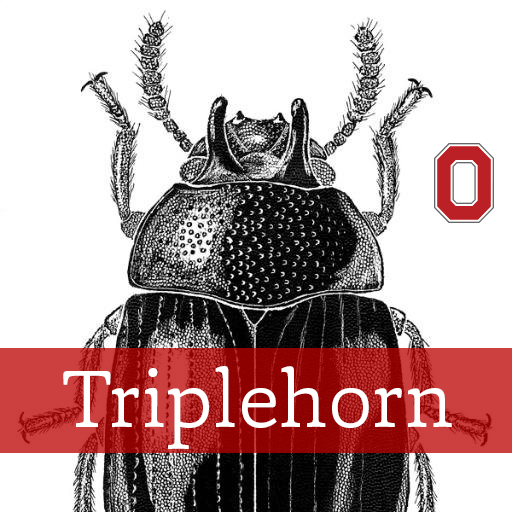 Charles A. Triplehorn Insect Collection. The insect collection contains about 4 million prepared specimens, nearly 3,000 primary types, and one of the world’s largest leafhopper collections. The collection formally began in 1934 by Prof. Josef N. Knull, and has strong holdings in beetles (Coleoptera), Hemiptera (true bugs and hoppers), Hymenoptera (ants, bees, wasps), Odonata (dragon- and damselflies) and Orthoptera (grasshoppers and crickets). Originally the specimens largely came from the United States, but we have expanded significantly since then. Recent collecting trips have been made to Brazil, South Africa, Australia, and Malaysia (Sarawak). Ongoing research is focused on the systematics of parasitic wasps and the development of information technologies to share specimen data and images globally. 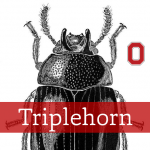 To know more about the Triplehorn collection, visit the website and follow the collection’s lively social media presence, which include the Pinning Block blog, a Facebook page, a Flickr image site & a Twitter feed. Acarology Laboratory. Initiated by George W. Wharton in 1951, the Acarology collection is considered one of the best and most extensive insect and mite collections in North America. 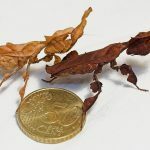 Over 150,000 identified and considerably more than one million unidentified specimens are included, preserved either in alcohol or on microscope slides. The geographic range is worldwide. The collection gets extensive use during the annual Acarology Summer Program, the foremost training workshop in systematic acarology in the world. More information about the Acarology Lab can be found on their website. They also maintain the Acarology Summer Program website. Borror Laboratory of Bioacoustics. 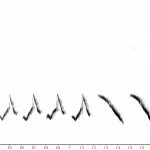 The Borror lab is one of the leading collections of animal sound recordings in the United States. The Laboratory is named for Dr. Donald J. Borror, and entomologist and ornithologist who was a pioneer in the field of bioacoustics. He contributed many recordings including the first sound specimen in the archive, a recording of a blue jay in 1948. 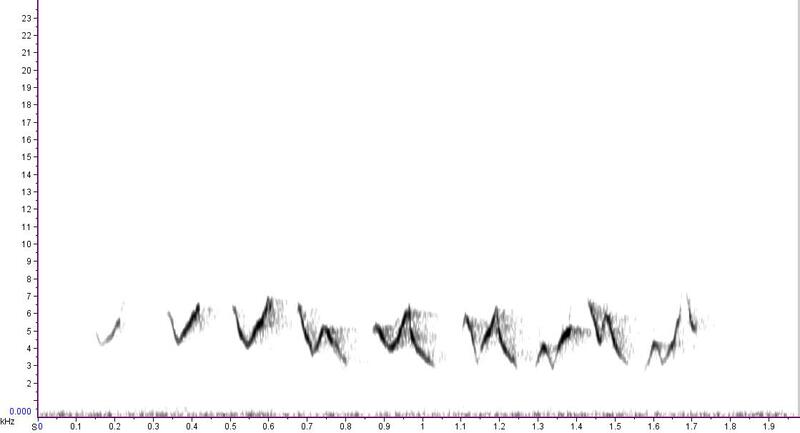 Today, the sound collection contains over 42,000 recordings, the majority of which are birds. Donald Borror also contributed many recordings of insects. 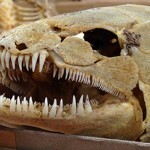 Mammals, amphibians, reptiles, and even fish are part of the collection. The recordings are widely used for research, education, conservation, and public and commercial media. Visit the Borror Lab website for more information and make sure to check their audio CDs. Herbarium. The OSU Herbarium was founded in 1891 by Dr. William A. Kellerman,well-known botanical explorer of Central America, pioneer mycologist (that’s fungi! ), and the University’s first professor of botany. It serves as a source of botanical data and as a base of operations for a wide variety of taxonomic, evolutionary, phytogeographical, and biochemical research programs; preserves specimens as vouchers to document present and past research studies or vegetation patters; serves as a reference point for the precise identification of plants, algae, protists, fungi and lichens; and serves the public by identifying plant specimens, providing morphological, systematic, and other information about plant species, and answering questions about plants, their properties and uses. The Herbarium currently holds over 550,000 specimens, including over 420 type specimens. For more information about the Herbarium visit their website. Molluscs. The Mollusc Division is really a collection of collections, containing over 1 million specimens in 140,000 lots. Over the years a number of private and institutional collections have been organized into the collection here today. The earliest large accession was that of Henry Moores (1812-1896) and was worldwide, both fossil and recent. 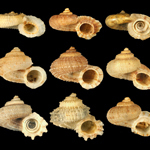 Moores assembled one of the most diverse collections of labeled shells of that period. The University purchased this collection around 1890, added several private collections to it, and cataloged the material as part of the holdings of the first organization of the Ohio State University Museum in 1891. This collection and others were given to the Ohio State Museum on Campus in 1925, maintained and enlarged for nearly half a century, then returned to the administration of the University in 1970. The Division of Molluscs has an interesting blog, Shell-fire and Clam-nation, and a website. Tetrapods. The Division of Tetrapods (amphibians, reptiles, birds, and mammals) is a repository of Ohio and North American species and some worldwide research expeditions. The collections were established shortly after the founding of The Ohio State University in 1870 and grew through the collecting efforts of OSU faculty. Specimens date as far back as 1837 and include many now-protected species as well as extinct species such as the Ivory-Billed Woodpecker, Carolina Parakeet, and Passenger Pigeon. The collection houses more than 170 amphibian, 200 reptile, almost 2,000 bird and 250 mammal species. 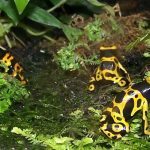 To learn more about the OSU Tetrapod collection, visit their website and their blog, Amphibians, Reptiles, Birds and Mammals. Fish. 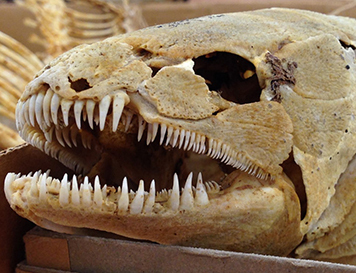 The Fish Division began with the collections of D. Albert Tuttle, OSU’s first zoologist. Officially recognized in 1895, the fish collection grew and moved from the Botany and Zoology Building to OSU’s Biological Station at Cedar Point, to the Ohio State Historical Society, to the Franz Theodore Stone Laboratory on Gilbraltar Island, to Sullivant Hall, and finally (whew!) to its current location as part of the Museum of Biological Diversity. The collection is primarily used as a resource for systematics research, laboratory teaching, and public education. It is also a resource for state and federal scientists who use it as a basis for comparative studies, document the geographic ranges of fish, and conduct ecological assessments and environmental impact statements. Visit the Fish Division website for more information about their activities. We hope you enjoy the blog and please send us your feedback! About the Author: Dr. Norman F. Johnson is a Professor with appointments in the Department of Evolution, Ecology and Organismal Biology & the Department of Entomology at The Ohio State University. He is also the Director of the Triplehorn Insect Collection. Norman studies the systematics and evolution of parasitoid wasps in the family Platygastridae (Hymenoptera).